IC Realtime has developed a remote-viewing platform that captures 720-degrees with no blind spots or moving parts. IC Realtime's 720-degree technology was originally implemented in Scuderia Corsa’s Ferrari 458 Italia No. 63. The 720-degree technology will make its way to market later this year in a brand-new series of two-lens mega-pixel cameras from IC Realtime called IC720. Different versions of the camera with interchangeable sensors and lenses to achieve a wide variety of video surveillance needs (including a 28-megapixel version) are currently in the works. According to Onuchin, the technology incorporates 15 unique aspects that the company has applied/received patent protection on. 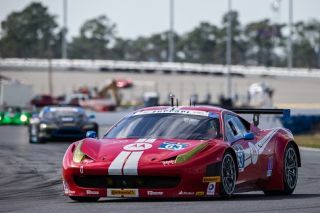 Founded in 2011 by Giacomo Mattioli and Art Zafiropoulo, Scuderia Corsa Racing With Ferrari is the 2013 Grand-AM Rolex GT championship-winning team that supports the racing needs of Ferrari clients through turnkey programs, GT endurance racing, the North American Ferrari Challenge Series and track events. IC720 worked closely with the team to incorporate the camera into the racecar. Streaming live high-definition video to mobile devices—and uncompromised at speeds in excess of 100 MPH—the camera is used during practice laps and is planned to eventually be used during racing as well.